DU first cut-off list…… Was on DD News Night : What should be the way ahead for INDIA? Once again it was that time of year when the Delhi University announced the first cut-offs for various colleges under it, late last night and was made public this morning by the newspapers. This year was more special because the date for announcing was deferred following the chaos created by the UGC vs DU wrangle on scrapping Four YEAR undergrad prog! UGC under the very same Chairperson who was praising the FYUP last year, did a volte-face on FYUP this year. The govt changed and so did the sing-song! When will our ‘EDUCATION LEADERS’ and ‘POLITICAL LEADERS’ see education as key to eradication of all ills? As long as education system is a tool in their hands for personal fights and glory, nothing can improve. Anyways, after the roll back of FYUP, the cut-offs were announced and lo behold, again 100% was the cut-off for a few courses in a couple of not so sought-after colleges! How? Why? 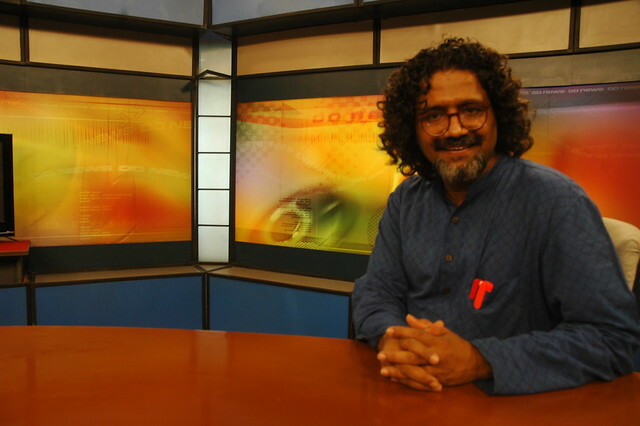 Doordarshan had called me to be on the panel to discuss the issue of DU cut-off list this year. In the DD studios I was with Dr. Pradhyuman Sharma, Principal, The Hindu college in the Hindi news bulletin, while I was with Dr. Varshney, Dean, Student affairs, South Campus of Delhi University in the English bulletin; while Mr. Ashok Ganguli, ex-chairperson, CBSE linked from Lucknow; We also had a student, who have had tough times in the DU admission process, in each of the bulletin, in the studios. High cut-offs? When students get 100% in Psychology and English, obviously the colleges have to keep the cut-offs at the maximum. Otherwise they may be inundated with so many forms and if they have to accept all of those who apply, then they had it. I got to know during the interactions, that a couple colleges were at the receiving end last year – over 1200 had to be admitted, when they thought an in-take of 180 for a particular course, as the college’s cutoff was low! So colleges are playing safe this year. Mr Ashok Ganguli spoke – in the CBSE results, over 60000 student scored more than 92% in Maths; many got 100% in English! He was talking about the grace marks being given, liberal corrections etc that has made it worse..
Education and Curriculum! Should our school education not orient towards skills and problem solving than rote learning and re-production. That is the only way to get out of this madness of 100% scores and Merit lists!! And get students with capabilities into higher education.. Applications : Every student hedges. Most students do not really know what they want to do in life. Hence they apply to inexplicable number of courses in as many colleges..This year there were 2,75,000+ applications for mere 54000 seats…. In all possibility the number of applicants may be 1.5 lakh, if we consider each one applying for multiple courses / colleges! Elimination vs Selection Why should the DU admissions be an elimination process? why cannot it be a selection process? why should it not have entrance exams for every course? In fact, the existing entrance exams for courses in English, Journalism too got abolished!! The entrance exams may get even not so high-scorers in board, but better off for the course! Why only Delhi? Why should DU get applicants from Dibrugarh, Ladakh, Pondicherry, chennai, Bangalore……. Is Delhi University, only centre for excellence? Do we as a nation lack any other centre of excellence? In the nation rankings of colleges, about only 20% of the colleges from DU come in the list, eighty percent are from other centres of excellence. Then why such a rush to Delhi? Should we convert a few of those outstanding colleges across the country to convert into universities with a few more colleges under their wings to mentor to increase their quality and standings. Is it the eco-system around the Delhi University that is most attractive and productive? or Is it a life-style choice? Is it the centre-of-power of the nation….Is there more opportunities here for student? More colleges? Is having more colleges in Delhi university the solution? How many more colleges will we have? Should you convert top colleges into universities with multiple campuses across the country? Why only a few courses? Do only these courses offer potential employment? Is it a flock mindset? How do we counsel and mentor students, their parents and families to opt for those courses and subjects that the students have natural flair for? Can the universities / colleges work with schools to help them facilitate this process? Should it not be the role of every faculty / professor to mentor students in the class? Entry of TOP foreign universities a solution? This has been lying in the cold storage for a long time. With middle-class families having more and more disposal income in their hand, with crunch of quality colleges, are looking at top universities of the world. Indians spend about $20 billion annually to get their education abroad! The universities abroad are eyeing Indians along with Chinese to fill their coffers! Will these families look at the best of the colleges setting up campuses in India? Of course, there are issues of – which universities will come to India? What is the pricing point at which families lap it up? How will we ensure quality of world standard? How will we attract the FACULTY of that caliber? Can we not lay emphasis on exit exams than the entrance gates? Can we not allow students to apply for any course of his or her choice irrespective of what scores they get? Can we not create Exit examination tough enough to award only those who are really good. For me it will not be a wonder if quite a few who undergo the technology-facilitated programme out-perform those who are admitted to campus-based programmes. I have had an exposure of over 14 years in this space of tech-facilitated learning and I can vouch for this way! Indeed there will be a great opposition for this model – one of the co-panelist was very vehement! But that is the way… Best of the world universities (MIT, Stanford, Harvard…) are going on to this platform, launching their MOOCs – ….. Phoenix set the tone! Our own IITs and IISc came together to initiate NPTEL (https://www.youtube.com/user/nptelhrd) to provide learning resources to Engineering students from those engineering colleges across the country that lack quality faculty and learning resources. This can be made more interesting and compelling…… by integrating with compulsory hands-on-learning with SMEs in such a way that the students get practical exposure while the SMEs get keen manpower…. We certainly need someone at the HRD ministry with a grand vision for our nation! Else we will be doing the delta changes and will go back and forth with protestations coming from all directions. This government has a mandate, it needs to take those bold steps to make a bit difference to the real driver – EDUCATION – for the nation’s excellence in every space.